A student who trained for terrorist combat at a paintballing centre and tried to join so-called Islamic State has been jailed for nine years. Humza Ali, 20, of Bromford Lane, Birmingham, flew to Turkey in January 2015 but was turned back. 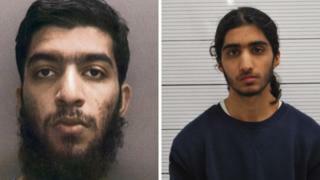 Ali was convicted in December of dissemination of terrorist material and attempting to travel to Syria for terrorist purposes. Co-defendant Ali Akbar Zeb admitted distributing extremist literature. Zeb, 20, of Northleigh Road, Birmingham, was jailed for 21 months. Both men were sentenced at Birmingham Crown Court on Tuesday. Zeb and apprentice bricklayer Ali shared graphic images and videos via a WhatsApp group to promote Daesh, the court heard. During the trial jurors had heard Ali had posed for "promotional" photos, alongside Mohammed Ali Ahmed, from Small Heath, Gabriel Rasmus, from Lozells, and Abdelatif Gaini at the Delta Force paintballing in Solihull in June 2014. Prosecutor Anne Whyte QC said the pictures - found on Ali's phone - showed the men dressed in quasi-combat gear while holding paintball guns and described it as a "bonding act of preparation between men of like mind and like intent". Passing sentence, Judge Mark Wall QC said Ali was a dangerous offender who posed a significant risk of serious harm in Britain and overseas. He said: "Having become a fervent support of Isis, you decided to fight for them. You seemed quite settled to the idea of dying for the cause in which you believed. "You then went on a paintballing trip. I have no doubt that this was used as a training exercise in weapons-handling by you, and the people who had the same ends in mind as you had." Ali, who was also convicted of sending malicious communications having directed "abusive" anti-democracy messages at a local councillor after making his way back to the UK from Istanbul via Ireland, was also given an extended five-year licence period. Rasmus was jailed in November for four years and three months after admitting preparing for acts of terrorism after he attempted to travel to Syria. Ahmed, who was tried separately, was jailed for eight years in December for his part in handing £3,000 to Brussels attacks suspect "man in the hat" Mohamed Abrini. Mr Gaini is thought to be in Syria.